The 2016-17 Broadway season ends with two bangs and a sort of whimper mixed with a chuckle. 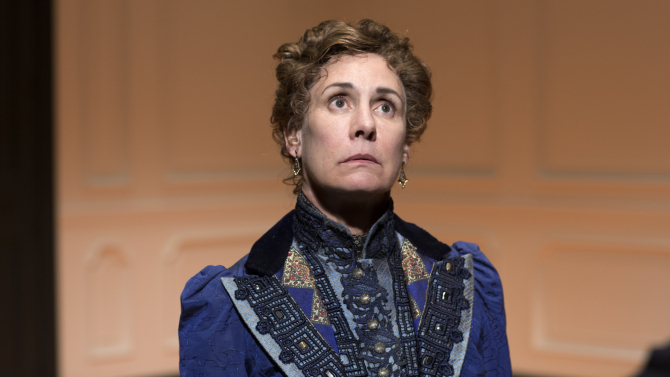 A Doll’s House Part 2 and Six Degrees of Separation examine difficult questions of identity in powerhouse productions while Charlie and the Chocolate Factory stumbles and trips but is kinda funny in a goofy way. Though written almost 30 years apart and set in different centuries not our own, the first two plays offer vital snapshots of how we live now. Their themes are timeless and so can be applied in 1890, 1990, or 2017. The silly kid’s musical is good for a couple of guffaws. The idea of a sequel to Henrik Ibsen’s 1879 classic of feminist rebellion has been tried before without success. The musical A Doll’s Life ran for less than a week in 1982 and played a slightly longer limited run in an Off-Broadway revival at the York Theater Company. So playwright Lucas Hnath took on a potentially dangerous assignment. He wisely builds on Ibsen’s premise but is not enslaved by it. 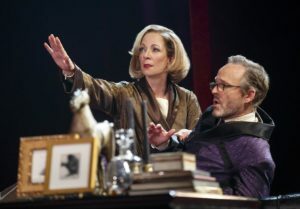 As he did in his previous taut Off-Broadway works The Christians and Red Speedo, Hnath transforms the stage into an arena where each character is fighting for his or her spiritual or emotional life and needs something vital from everyone else in the play. It’s 15 years after Nora Helmer slammed the door on her repressive union to the unimaginative Torvald. In the interim she has transformed from a fluttery squirrel to a successful author advocating the abolition of matrimony, but it turns out her husband has never officially divorced her. She needs this official decree to avoid a scandal, but he refuses and that’s the crux of the drama. The servant Anne Marie and the Helmers’ daughter Emmy also have stakes in the outcome of the conflict. Hnath has these four speak in contemporary dialogue, which somehow is not a distraction, and brilliantly depicts the messy aftermath of a dramatic gesture like Nora’s escape. This is so much more than a sequel, it’s a gripping examination of the ways people try to live together under a restrictive society and what happens when they fail. Each of the battling quartet is treated like a full human being with noble and petty motives rather than as spokespeople for a stance. Sam Gold’s measured direction injects just the right amount of humor to leaven this living-room war (Miriam Buether’s set resembles a lecture hall and David Zinn created the handsome period costumes.) Laurie Metcalf is a strikingly complex Nora, at once the brave heroine forging her own future and a narcissist bent on achieving her own ends. The actress boldly gives equal weight to both sides of Nora’s personality and is unafraid to expose her less than pure objectives. Her timing is amazing, earning laughs and gasps with the merest look and gesture. Chris Cooper has a bigger challenge as the buttoned-up Torvald who is as tightly bound as his massive overcoat. He skillfully reveals the broiling interior beneath this seemingly placid banker’s exterior. Jayne Houdyshell as Anne Marie and Condola Rashad as Emmy create in-depth portraits of two characters who are largely incidental in Ibsen’s original. Similarly, Hnath expands on a classic and provides his own insights into the issues it raised over 100 years ago. 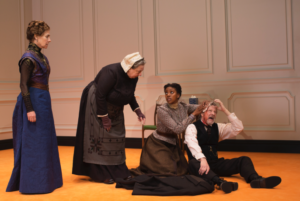 Just as both parts of A Doll’s House speak to us today, John Guare’s 1990 Six Degrees of Separation is startlingly relevant though certain technological aspects of its plot are outdated. A young African-American con man claiming to be the son of Sydney Poitier would now be found out with a quick Google search. But the longing for identity and a home is just a strong a motivation despite the supposed extended community of the Internet. Based on a real-life hustler, Paul deceives several wealthy Manhattanites by posing as the movie star’s offspring and the chum of their bratty college kids. Chief among those duped are Ouisa and Flan Kittredge whose liberal guilt and alienation from their own children draws them to the charismatic young man. When the schemes are revealed and Paul further complicates the couple’s lives, Flan is outraged, but Ouisa will not dismiss the experience and attempts to make a lasting connection, to reach through the six degrees that separate everyone on the planet. Guare’s merciless observations of our media-driven, shallow society still hold. But the play was overlooked for the Pulitzer and the Tony in its original production in favor of the sentimental Lost in Yonkers by Neil Simon who dismissed Six Degrees as slick. Trip Cullman’s sharp revival veers close to the edge of such slickness in its satiric broad strokes, but never takes the fatal leap. 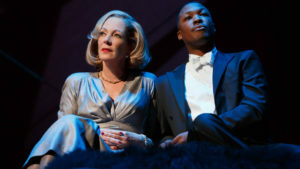 Just as Chris Cooper sheds Torvald’s protective covering, Allison Janney slowly peals back Ouisa’s shell of sophistication to expose the vulnerable, confused woman beneath. Corey Hawkins captures Paul’s quicksilver intelligence as well as his pathetic desperation. John Benjamin Hickey conveys Flan’s basically superficial nature. (Ouisa and Flan’s marriage somewhat resembles that of Nora and Torvald with the wife wanting to explore new territory and the husband holding back.) In a uniformly vibrant and large company, Michael Countryman, Lisa Emery, Colby Minifie, Chris Perfetti, and Ned Eisenberg have moments to shine. Mark Wendland created a rich, suggestive set, perfectly lit by Ben Stanton. Clint Ramos’ costumes suggest the luxurious and aspiring-to-be-luxurious lifestyles of a cross-section of America in this still-relevant and entertaining play. 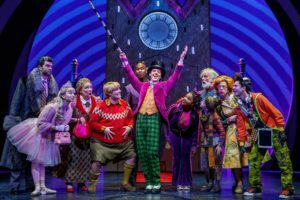 Charlie and the Chocolate Factory is neither relevant nor even consistently entertaining, but it does provide the occasional guilty-pleasure shot of sweetness, like one of Willy Wonka’s candies on conspicuous sale in the Lunt-Fontanne lobby. Unfortunately these are few and far between. 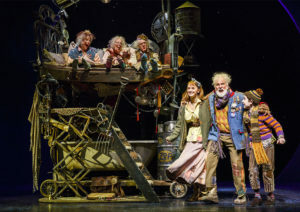 Derived from Roald Dahl’s beloved novel and the 1971 and 2005 film versions, this uneven kiddie show takes us on a roller coaster ride with too many flat stretches. The score incorporates four songs from the ’71 movie by Anthony Newley and Leslie Bricusse as well as new numbers by Marc Shaiman and Scott Wittman (some were also in the London stage version which has been reworked for this Broadway production). The old tunes such as “Candy Man” and “I’ve Got a Golden Ticket” remain sources of delight as do a handful of the newer ones. But David Greig’s book misses the strong narrative drive of the original and the cinema versions. The entire first act is stretched-out tease leading up to a wacky tour of Wonka’s Dr. Seuss-like confectionary in Act Two. The big secret is revealed at the very opening—no spoilers here—so that Christian Borle as Wonka can have more stage time. Plus a vital character—the mysterious stranger apparently working against Wonka and attempting to influence his five kiddies guests to betray him—has been cut, eliminating any dramatic tension. Borle’s chocolatier lacks the charm Gene Wilder displayed in the 1971film and instead gives us a mean-spirited zany who can do comic voices and accents. On the plus side are a vicious Nutcracker Suite ballet spoof, and several of the comic numbers introducing the awful factory-tour winning kids. These roles are all played by adults, except the lead part of Charlie, enchantingly played by Jake Ryan Flynn, one of three alternating child actors, at the performance attended. I was less than enchanted with puppet designer Basil Twist’s Oompah Loompa creations and the usually precise Jack O’Brien’s splatter-shot direction. There are occasional zingers that land, mostly delivered by Jackie Hoffman as Mrs. Teevee, the mother of the most obnoxious of the nasty kids. Too bad they haven’t written a new Broadway musical for her caustic talents. Maybe in 2017-18. Opened April 27 for an open run. Golden Theatre, 252 W. 45th St., NYC. Tue 7pm, Wed 2pm & 8pm, Thu 7pm, Fri 8pm, Sat 2pm & 8pm, Sun 3pm. Running time: 90 minutes with no intermission. $39-$149. (212) 239-6200. www.telecharge.com. April 25-July 16. Barrymore Theatre, 243 W. 47th St., NYC. Tue 7pm, Wed 2pm & 8pm, Thu 7pm, Fri 8pm, Sat 2pm & 8pm, Sun 3pm. Running time: 90 minutes with no intermission. $49-$149. (212) 239-6222. www.telecharge.com.